The State of Utah is required by the Securities and Exchange Commission (SEC) Rule 15c2-12 to file financial and operating information on an annual basis. Based on SEC requirements, this annual information is similar to the type of information included in the final official statement for the bond issues. 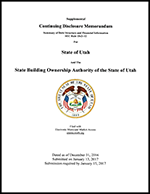 The current, 2018 State of Utah Continuing Disclosure, published by the Utah Division of Finance, is formatted in portable document format (PDF). To view this file, download a free Acrobat Reader.